Many millennial women have found themselves in the unenviable position of having to delay major purchases due to a number of economic factors, including employment, student debt, and other financial hurdles. While the outlook has been improving recently, according to a recent poll from MSN, 54% of millennials overall expect to wait two years or more before purchasing a new car. 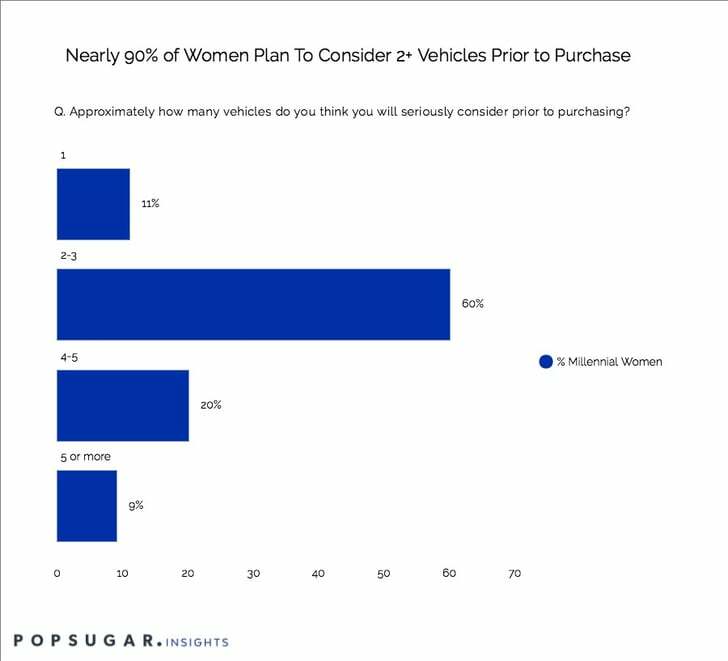 As part of our 2017 POPSUGAR Insights Auto Report, we surveyed over 1,200 US millennial female in-market auto shoppers to tell us about when they plan to purchase a vehicle, why they are considering a new vehicle, and how many vehicles they plan to consider as they move forward purchasing. We learned that nearly 40% of millennial women plan to purchase a vehicle within the next year. Leading reasons for purchasing a vehicle included it being their "first vehicle," because the "current vehicle has high mileage," they need a more "reliable vehicle," or they want "something new." Nearly 90% of millennial women plan to seriously consider two or more vehicles, while 29% plan to seriously consider more than four vehicles. Over 60% of millennial women are seriously considering a new vehicle or are open to a new vehicle. In terms of specific audience segments, upper-income millennial women (who earn $75K+) are 48% more likely to be considering a new vehicle, while Hispanic millennials are 62% more likely to be considering a new vehicle.